Houston Texans rookie Julie’n Davenport is in a competition to start at right tackle in place of the injured Derek Newton, according to the Houston Chronicle. In the 2016 Senior Bowl, Davenport struggled in pass protection, earning a 35.3 overall grade for his performance in the game as he allowed one sack, one hit, and one hurry in pass protection across 22 pass blocking snaps. 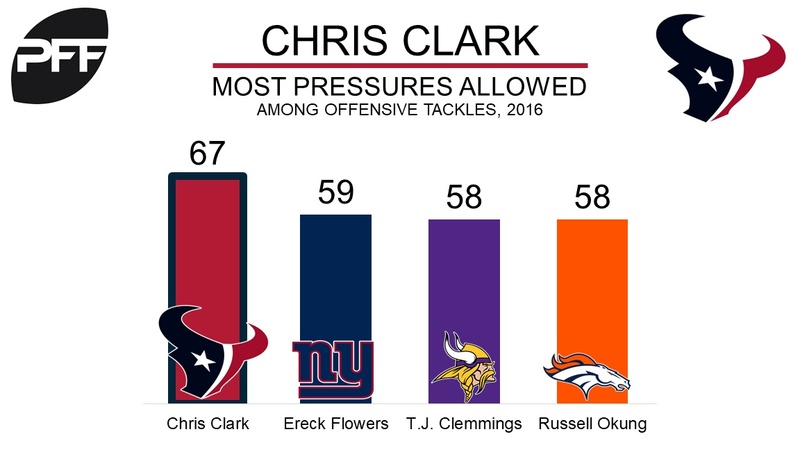 Also competing against him is veteran Chris Clark, who started 11 games at right tackle last season. He earned a 37.7 overall grade and allowed the most pressures of any offensive tackle in the league last season, by a comfortable margin.